My father was furious with me—and rightly so—when I snuck this photo out of the family album and took it to school for show-and-tell in the fifth grade, snapping it in half in the process. It is of my Great Aunt Lydia Alhsteadt Ranck, sister of Agnes Marta Alhsteadt, my great grandmother. Lydia is wearing a variation of the national costume of Finland, where my dad's family is from. (Unfortunately, I don't have a similar photo of my great grandmother.) This branch of the family was from Helsinki. 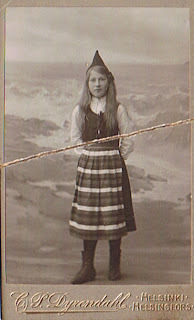 While Lydia stayed in Finland, my great grandmother made the journey here to Chicago by herself, at the age of seventeen, to live with another one of her sisters. It was 1913 or so when she arrived in Chicago. I'm not sure what year she found her way to the north side. She ended up marrying a nice Finnish boy and had three children, including my grandmother, Elsie, who would grow up to marry a nice Finnish-American boy of her own and have three children as well, including my father, Ron. Every once in a while, I pull out this photograph of Aunt Lydia, and wonder what it would have been like if my great grandmother had stayed in Finland as well. I wouldn't be writing an Uptown Chicago blog, that's for certain. It's strange how the decisions we make—where we'll live, who we'll marry—have a lasting effect on those who come after.